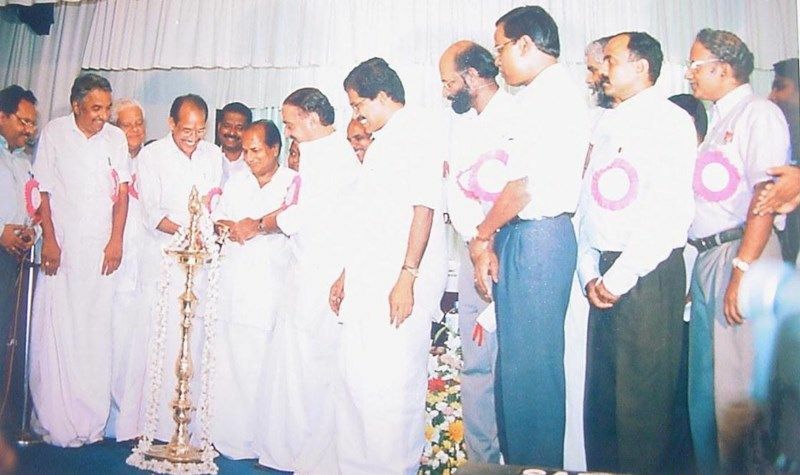 This third Dental College under government sector in the state was formally inaugurated by Sri.A.K.Antony, Hon'ble Chief Minister of Kerala on 1-10-2002. Sri.P.Shankaran Hon'ble Minister for H&FW presided over the function. Sri.K.M. Mani Hon'ble Minister for Revenue & Law inaugurated the Dental Specialty Service of the College. The foundation stone for the new building was laid by Sri.P.Shankaran Hon'ble Minister for H & FW on 28/04/2003. The function was presided over by Sri.Thomas Chazhikadan MLA. 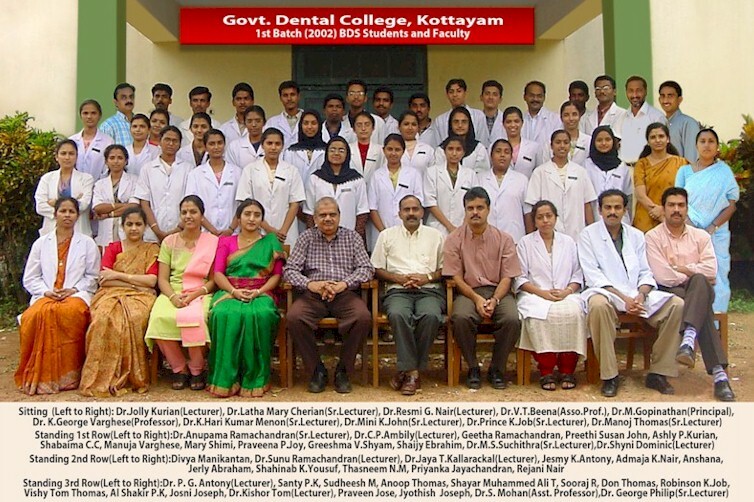 Ever since the inception of Medical College, Kottayam nearly 40 years back a Dental Department was attached to it. However, later it was realised that the nature of work that was under taken mainly was Oral Surgical. Hence in 1992 the Dental Department was re-designated as Department of Oral & Maxillofacial Surgery. This department is considered to be the referral centre for minor and major maxillofacial surgical cases of Central Kerala, comprising of Kottayam, Idukki, Pathanamthitta, Ernakulam and Alappuzha districts. While offering quality Oral & Maxillofacial surgical services, the people of Central Kerala were not provided other specialised dental treatment in government sector in Central Kerala. They had to approach private dental practitioners or seek treatment either in Thiruvananthapuram or Kozhikode Dental College. Hence it was only reasonable that facilities for specialised dental treatment be made available to the people of Central Kerala through the establishment of a Dental College attached to Medical College, Kottayam. At that time in the government sector, there were only two Dental Colleges in the state one at Thiruvananthapuram and the other at Kozhikode with an annual intake of forty students in each college. Hence students seeking admission for BDS course have to depend on private institutions in the neighboring states. Hence, the necessity for a Dental College at Kottayam attached to the Medical College, was suggested by many. It was only in 1998 December a few months after Dr.P.Chandramohan (Prof.& Head of Cardio Thoracic Surgery) assumed charge as the Superintendent of Medical College Hospital Kottayam, that a substantial move was made in this direction. The idea occurred a brain wave to Dr.Chandramohan to present the matter of a new Dental College before the Hospital Development Society. Dr.Chandramohan entrusted Dr.George Varghese, HOD, Dept. of Oral & Maxillofacial Surgery to draft a detailed project report within a fortnight to present before the HDC meeting to be held in the third week of January 1999. The HDC meeting held under the Chairmanship of the District Collector of Kottayam Sri.Biswanath Sinha IAS, unanimously agreed to submit the matter before the government so that it may be included in the budget. Nearly at the same period the College Committee of Management also agreed to recommend the starting of the new Dental College and pursue the matter with the government. The need for the institution was repeatedly brought to the notice of the government by the public and political leaders of Kottayam. Dr.B.Ekbal (formerly Prof & HOD of Neuro Surgery) as Member of Planning Board of Kerala played a crucial role in allocating sufficient funds for the Kottayam Dental College in the 2000 budget . Finally, the dream came true in March 2000 when Sri. Sivadasa Menon, Hon'ble Finance Minister presented the Kerala State Budget. An amount of Rs.10 Lakhs was included for starting a new Dental College at Kottayam with an annual intake of 40 students for BDS course. This was a great day of rejoice for the people of Central Kerala. The Government of Kerala accorded administrative sanction for the establishment of the Kottayam Dental College vide G.O. (MS) No.209/2000/H& FWD dated 7-8-2000. The present teaching department , Oral & Maxillofacial Surgery attached to Medical College, Kottayam and the building vacated by the pre clinical departments of Medical College Kottayam were decided to be utilized for the Dental College. Dr.K.George Varghese, HOD, Dept of Oral & Maxillofacial surgery, Medical College Kottayam was nominated as the Special Officer. Maintenance work of the existing building was carried out by the PWD and purchase of the necessary machinery and equipment were made. The Mahatma Gandhi university granted affiliation for the college vide Order No. U .O. 2322/A1(2)/2000/ Acad. Dtd.3-1-2001. For the formal approval of the college by the Dental Council of India , application was submitted before the Ministry of Health & Family Welfare, New Delhi , by the DME in February 2001 with all the necessary documents and a detailed Techno Feasibility report. The office of the Dental College was inaugurated by the Hon'ble Minister for Health & Family Welfare Sri.V.C.Kabeer on 17/03/2001. Dr.K.T.Sreelatha took charge as the first Principal of the new college on 8-11-2001. Copyright © 2004-2019 www.gdckottayam.org | Website designed by Dr.Rajeev Simon Kurudamannil.